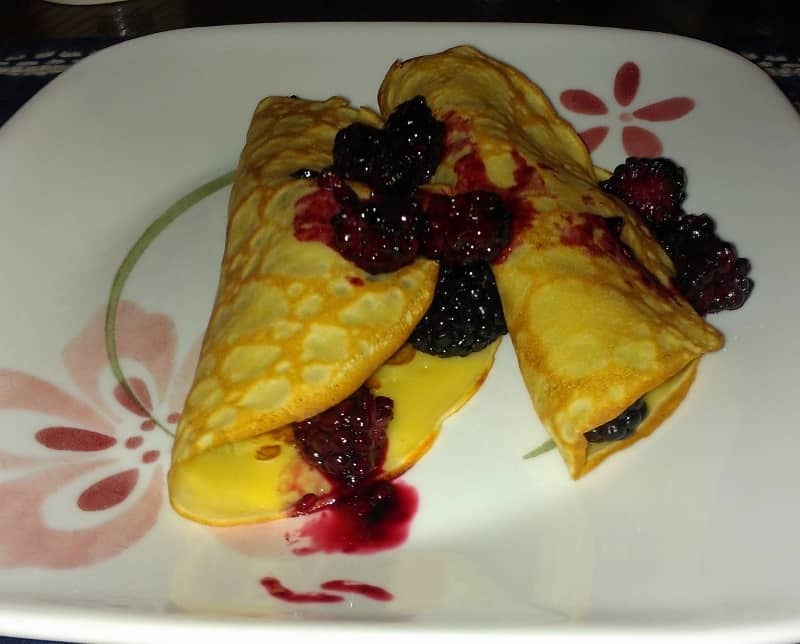 My second foray into trying out my new gluten-free cookbook was crepes. I determined that crepes would be a perfect vehicle for both dulce de leche that I planned to make, and would pair well with bellinis for breakfast. I didn’t have dulce de leche prepared, and we didn’t have bellinis, but I decided to make the crepes anyway. I had blackberries and lime curd around, so I just couldn’t talk myself out of them. Blend all ingredients in a blender. Heat a small, 6-inch nonstick skillet or crepe pan over medium heat. Spray with cooking oil. Pour a small amount of batter (about 3 tablespoons) into the pan and swirl the batter to coat the bottom of the pan. It may help to measure the batter the first time to see how much batter to add, and then eyeball the measurements from there. Cook for 1 minute, until browned; use a nonstick spatula to get under the crepe and carefully flip. Cook another 30 seconds. Remove crepe to a plate and cover with foil. Repeat with remaining batter, spraying the pan with oil between crepes. Remember that your first crepe is always a practice crepe. Yield: about 9-10 crepes. These turned out surprisingly well. I seldom make crepes at home because I’m not very good at cooking them, but somehow I didn’t have any problems with these once I got past the first crepe. I didn’t notice any difference between these crepes and what I’ve had when I’ve gone out for breakfast. The crepes were sweet and a little chewy. They didn’t tear. This was a rather simple and fast recipe to make. I’d make them again sometime.